Dr. Samuel C. Durso reflects on his personal history with the groundbreaking Reichel's Care of the Ederly, now in its seventh edition. The 7th Edition of Reichel’s Care of the Elderly: Clinical Aspects of Aging is a pioneering text for physicians and other health professionals. Therefore, I was honored to be asked to edit and contribute to this latest edition. However, I could also not help but appreciate the small irony that when I first picked up a copy of the book – the 4th edition, for which Bill Reichel was the Editor-in-Chief – I was a practicing internist who hardly knew what ‘geriatric medicine’ was. The time was early 1995. Then, I was part of a four-person, Internal Medicine practice in Columbia, South Carolina. My partners were my three brothers-in-law, all internists, fairly close in age and experience. In 1995 we had been together for a dozen or more years in a practice that resembled a bit of old-fashioned primary care, hospital medicine and consultation to other physicians in the community. Without a doubt, we thoroughly enjoyed our practice together, because we shared intensely the challenge of internal medicine: knowing our patients, attention to detail, diagnostic reasoning and helping patients feel better regardless of their health challenges. So how did I find myself in Baltimore, twenty-one years later, writing a chapter and editing this fantastic book? My wife and I had decided that for educational reasons, Baltimore offered opportunities for our two small daughters that were not available in Columbia. Somehow, we needed to figure out how to make the move, though I didn’t have a clue how to pull that off. I had entered practice right out of residency, literally hanging up my shingle with my brothers-in-law and growing a practice by word of mouth. Corporate medicine in 1994-5 was the exception rather than the rule. There was no Google to search. Although we had a few friends in Baltimore, I did not know the medical community and was not sure how to go about finding a practice. I was not in a position to simply start over. So I picked up a copy of the New England Journal of Medicine, figuring it was a respected publication, and thumbed the jobs section in the back. One of the ads that caught my eye was a new position available in the Division of Geriatric Medicine and Gerontology at Johns Hopkins. Honestly, I wasn’t sure what a geriatrician does – nursing home medicine exclusively? I knew that for a few years leading up to 1995 there was a certification process for geriatric medicine, but that was now closed. In any case, I ordered a copy of Reichel’s text, responded to the contact, and sent my CV. Very quickly, an interview was scheduled, I met faculty, a job was offered and I was in Baltimore in April of 1995. In spite of the serendipity and my circuitous route to geriatric medicine, Reichel’s text was a key element in my conversion from internal medicine to a career focused on care of the elderly. First, it was comprehensive, yet readable. It was and remains very clinically focused while providing necessary theory where useful. And, for an individual like myself, who was not fellowship trained though clinically experienced, it communicated a philosophy – the nuance of caring for persons with frailty, disability and multimorbidity – that gives geriatric medicine its special character. 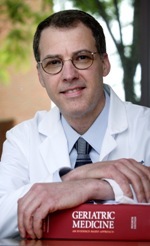 Starting at Johns Hopkins in 1995 through to the present, I must say that for an internist who still loves knowing his patients, attending to detail, applying diagnostic reasoning and helping patients feel better no matter their health challenges, geriatric medicine is a wonderful career. And I keep Reichel’s current text on my desk because it is one of the easiest and quickest reference I can turn to.